After so many seasonal and occasional collection, now Annus Abrar is back with awesome and stunning Annus Abrar eid collection 2013for women.Annus Abrar has launched this beautiful collection with full of elegant looks and designs in awesome stitching styles. Annus Abrar is one of the new emerging fashion designer in Pakistan.Annus Abrar is a talented fashion designer, who has emerged on the screen of fashion in year 2012 with the aim is to caters women with eligible outfits.Annus Abrar has launched so many collection and always gained a huge response because of his aesthetic designs and collections.Recently, Annus Abrar eid collection 2013 has launched for women.Annus Abrar has designed and released this beautiful collection with full of elegant looks and styles.These dresses are looking awesome in their stitching styles such as long shirts, frocks and maxis with tights and trousers.Annus Abrar has embellished this collection with embroidery and laces on neckline, sleeves and borders.These dresses are perfect for Eid-Ul-Fitr 2013, which is coming very fast.They all are lovely, trendy and wearable.The colors used for this eid collection 2013 are bright such as white, green, red and etc etc.Girls!! just wait a bit here and have a look at this collection by Annus Abrar here below..
Annus Abrar Eid Collection 2013 For Women. 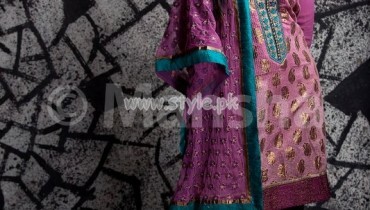 Annus Abrar Eid Dresses 2013.